Years ago, before home smokers became more commercially available, the best way to taste the amazing flavor of smoked salmon was at your favorite restaurant. These days, all you have to do break out your smoker, grab some low-sodium Jamaican Jerk Seasoning and you are more than halfway there. If you don’t have a smoker, don’t worry, you can also achieve the great flavors of the Caribbean while cooking on the grill or in your oven. 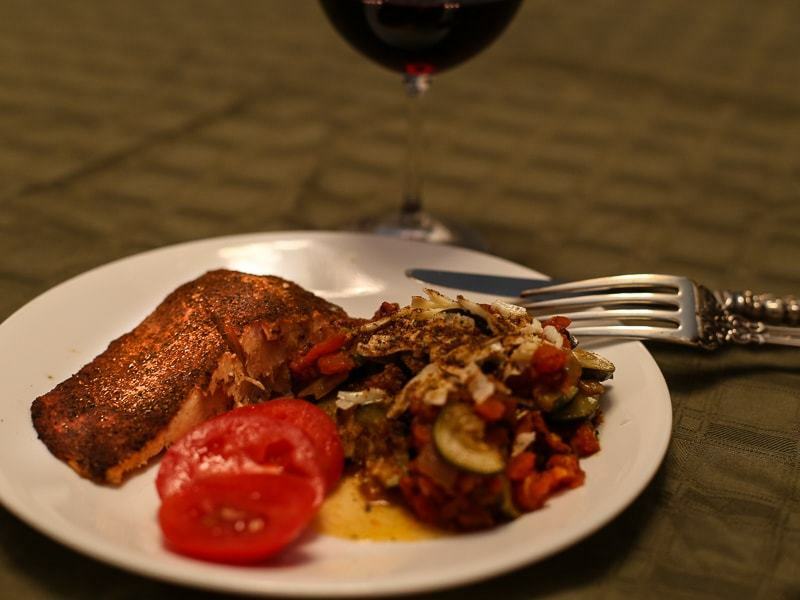 Your salmon won’t be smoked, but it’s still a delicious, low-salt recipe that’s quick and easy! Our goal at Sensational Seasonings is to share healthy recipes that allow you to quickly prepare meals at home that taste as good as your favorite restaurant. We think this one fits the bill! This is also a perfect recipe for those on a low-salt diet. If your goal is to avoid as much sodium as possible, choose Sensational Seasonings, salt-free Pork Rub or Italian Herb! 1 cup of wood chips (only if you are using an outdoor smoker). I recommend a ‘mild’ wood chip like cherry, apple, orange, maple or peach. Other wood chip choices like hickory or mesquite are considered ‘strong’ and are not recommended with this recipe. 2. 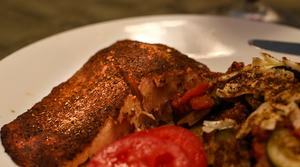 Prepare the salmon by sprinkling most of the 1/2 cup of Jamaican Jerk Seasoning across the top (meat side) of the salmon. Save just a tablespoon or two of the seasoning to add when serving (for additional flavor). Tip – Don’t try to remove the Salmon’s skin before cooking, it comes off much easier after cooking. 3. Put the salmon filet in the smoker skin side down. It will take approximately 45 minutes to an hour before the ideal temperature is reached. IMPORTANT: This is only a approximate time – reaching the target temperature is more important. Use a digital thermometer and cook until the filet reaches a temperature between 145°F and 155°F. Make sure that you measure the temperature in the thickest part of the filet. 4. Once the temperature is reached, remove the salmon and separate the skin from the filet before serving. Tip – If you want more flavor, sprinkle an additional tablespoon or two of the remaining seasoning before serving. Trust me, it’s worth it! Combine with healthy sides for a tasty and nutritious meal.